Please note: Only available on Day Tour Combo Packages. Animal lovers will be in paradise on this visit to Phillip Island! Get acquainted with a cuddly koala at Maru Koala & Animal Park, visit Seal Rocks and witness the magical Penguin Parade, all the while being surrounded by stunning coastal scenery. The first stop is Maru Koala & Animal Park for up close and personal encounters with koalas, kangaroos, Tasmanian Devils and much more! 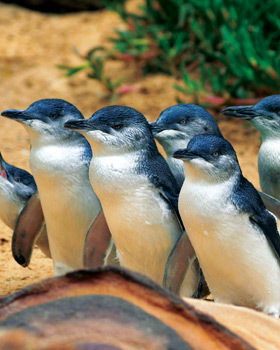 Before you head over to the home of the famous Penguin Parade, Phillip Island. Before reaching the site of the Penguin Parade you’ll see the ‘Nobbies’, so named for its unique rock formations. Located at the western tip of the island, this area has high conservation significance due to its population of penguins and graceful seabirds. So you think the koalas are cute – just wait until you see the Little Penguins. After visiting the information centre and souvenir shop, you’ll head down to Summerland Beach to witness some penguin magic. Just as the sun sets, the wild Little Penguins emerge from the sea after a hard days fishing and waddle across the sand to their dune burrows. These Little Penguins are the smallest of the penguin species and Phillip Island is home to the largest colony in the world. It’s easy to understand why this wonderful spectacle is one of Australia’s most popular wildlife attractions. This trip leaves at 1pm and runs for approximately nine hours. It includes pick-up from selected hotels. Make sure you don't forget your camera and some warm clothes as it will get cold after the sun sets.